Happy Monday, Everyone! Check out my guest post at Rantings of an Amateur Chef! Today we have another guest post. Last time Betsy from Crowded Earth Kitchen was here, she was in the Diced! Dessert Challenge with her Thanksgiving Pie. 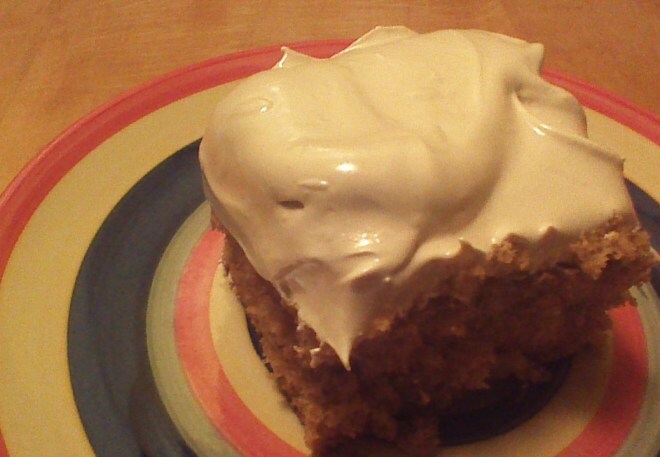 Check out another great dessert from her below and her regular writing at Crowded Earth Kitchen…. 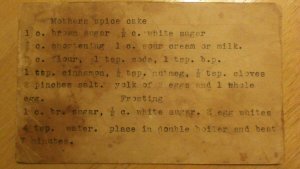 This recipe should really be called “Mother’s Mother’s Mother’s Spice Cake,” because I believe it originally belonged to my Great-Grandmother. Take a look at the recipe card below, typed on an old school typewriter… clearly, this is a very old and much loved favorite! I love how this recipe, like so many old recipes, is really just a list of ingredients. In some cases, it can be very difficult to recreate a dish from ingredients alone! In this case, however, coming up with instructions and baking times was pretty straightforward. The updated set of instructions below are user-friendly and simple enough to follow with confidence. ← Will you share a recipe?